Day 50. 39 degrees and a north wind in my face. I left Vanderpool knowing I had one more big climb with some more smaller steep hills peppered along the way. The plan. My crew dropped me off and went for coffee. They would meet me in a half hour in case I needed my 29 Schlumpf to climb the major hill. Three miles into my ride I saw a hill that curved out of sight. A fellow walking his dog that way said I was headed for a long climb. I said that’s what I heard. A third of the way up I could see the rest of the hill. I was in an anaerobic state and had to take a breather. The guy caught up to me and said when he first rode his mountain bike up the hill he stopped stopped in the very same place. He said he slalomed up the road to take the edge off the gradient. I started up again and passed him then had to stop again 2/3 of the way up. He passed me again and said he would see me at the top. We arrived at the top about the same time. I rode on covering about 7 miles at an average of 7.5 mph riding speed when my crew showed up. The wind was strong in my face so I could not ride in high gear. I kept hitting little hills that should have been no problem. I leaped frogged with my crew the rest of the day. As the day wore on the hills got smaller but were 10 to 12% grades. My quads were shot. I just got off at one point to take a break and heard my phone ring. I hadn’t had cell reception for 3 days. My son called and I asked him what I should do to help my quads recover. He suggested immersion in an ice bath or cold pool. Shortly after he called the road finally flattened out and I was able to ride in high gear and give my quads a sorely needed break. 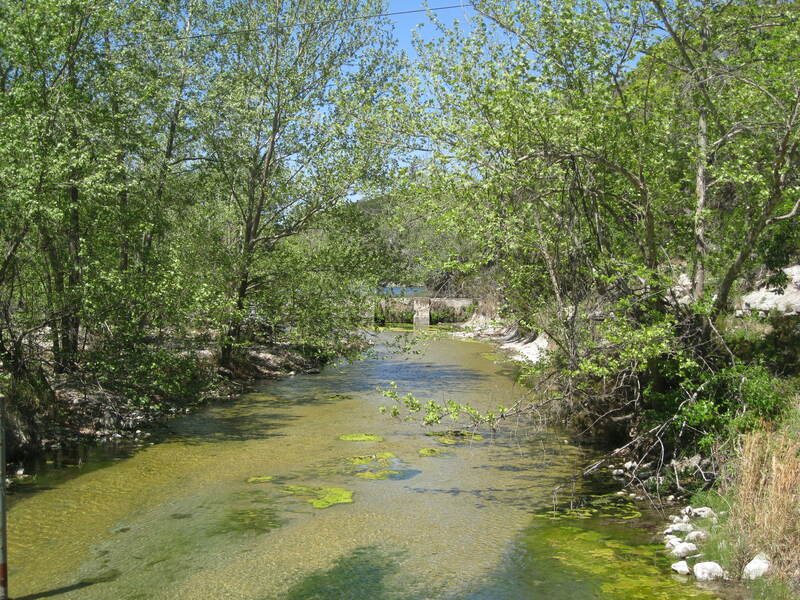 I must have crossed the Guadalupe River half a dozen times or more. I stopped in Hunt and ate a pint of chocolate ice cream. I figured if I couldn’t cool down my legs one way I would do it another. I stopped in Hunt for the day. My cook was whipped from sorting wildflower pictures all day so we went to a local Mexican restaurant for dinner. To make sure I am getting enough calories I had a double chocolate cheesecake for desert. At the restaurant a fellow walked up to our table and asked if I was the unicycle man. I said yes and he wanted his two sons to met me. 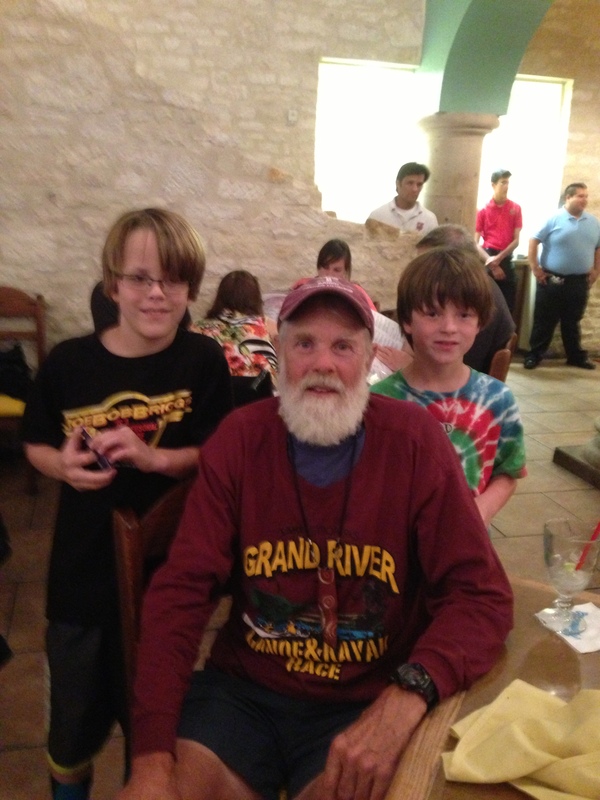 His sons Matthew and Andrew belong to a small unicycle club in Austin Texas. The Kerrville KOA graciously supported my cause by giving us a break on our camping fee for the night. sorting wild flowers can be a process. maybe she should stick to tame flowers? those hills are brutal. still seem more pleasant than riding through molesasses. oh no ! did i say that out loud? It hasn’t snowed on me on the ride so far, but I am amazed it still gets down in the 30’s at night sometimes. Dave, My sons, Matthew and Andrew really enjoyed meeting you. You’re an inspiration. Good luck godspeed on the rest of your journey. We’ll be following your progress! It was fun to meet you too, Hope your boys can make one of the national conventions one day. 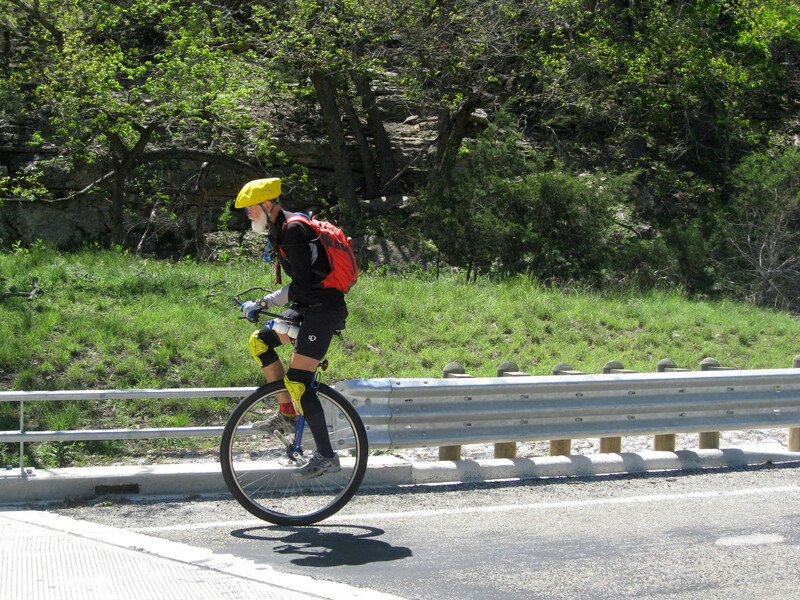 It is amazing to see what unicycle riders are doing these days. Yeah! Halfway. I don’t care what time of day it is I’m always about a little cheer. weather it is ice cream or a little liquid in any form. Go David Keep on keepin’ on! Those boys will remember you and might following in your wheel tracks someday!